This week included upgrading some woodworking jigs, writing an article, making an assembly sled and then photographing and posting new products. Not the busiest of weeks but some important things definitely happened. I'm going to call this week "Why won't my finish dry?" Last Sunday I put the Danish oil finish on the 2 constellation cipher wheels and then waited until Wednesday to start the Minwax wipe-on poly. That should have been plenty of time for the oil to cure, it's how how I usually wait. After applying the first coat of poly, which usually dries in 2-3 hours, it was still tacky several hours later. I waited until morning, still tacky. I put them outside whenever I saw the sun, still tacky. Finally got them feeling pretty good by Friday night, put on another coat, same thing happened. Let them sit with a fan on them Saturday, then out in the hot sun on Sunday and they are finally starting to feel like the finish is curing. My thinking is that the US East Coast has had a monsoon season lately and it's very humid. If the oil hadn't completely cured, it could slow down the poly. Plus, humidity can slow down poly curing anyway. So, it's a waiting game. If they get pretty dry, I may just do a final coat of shellac to seal anything away. And here I wanted them listed on Etsy today! The week was light so I decided to put some time into making a few a things I've wanted. The first of these was a cube beveling jig out of Brian Menold's Wooden Puzzles book. For a guide on how to make cube puzzles, this is a great book. I don't know Brian or have any relationship with him, I just found his book very informative. I whipped up one which is just two little beveled strips glued to a board that has a runner that rides in the disc sanders guide slot. You put the cube in and sand each edge. Keep flipping till they are all done. This makes every bevel the same. When I have a few more free minutes I plan to add another set to the other side with a slightly wider opening so I can do different bevels. 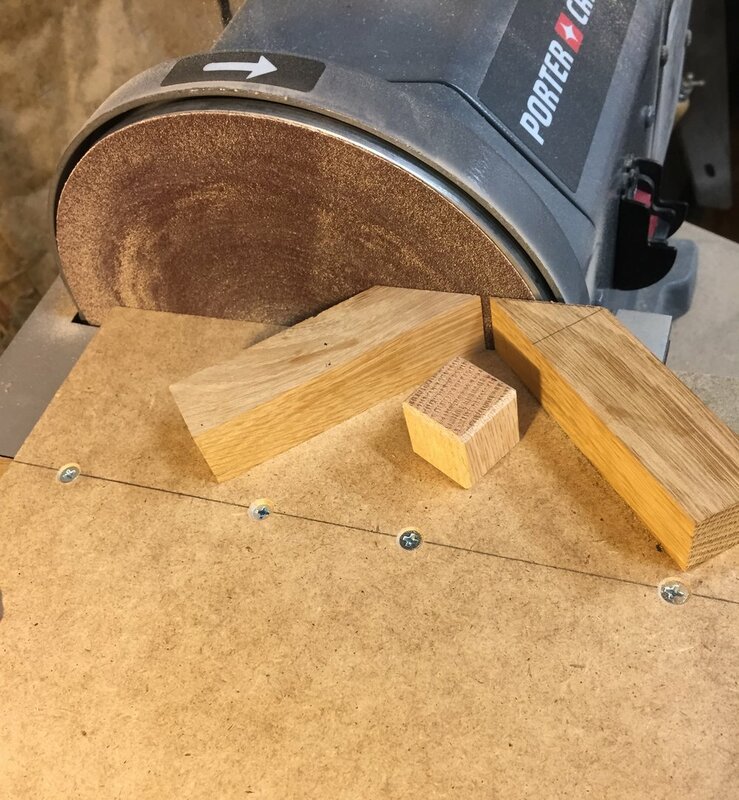 After that I turned to my puzzle makers sled for the table saw, I've needed to get some new attachments done for it, and this was the perfect time. I made new stops that I can use together to make very small adjustments. You can see in the picture the two stops above the right side of the fence. The right most one stays fixed and it's separated from on to the left by some paper spacers. Those bits of paper are around 0.015 inches, so by adding or removing them you can change the distance to the blade and make very small adjustments. And it's as easy as loosening the left stop and making the change and tightening it back down. Then I made the hold down you see on the left into a slotted adjustment so I can position it in more place - here you see it spanning the blade to hold a part in place. Keeps me from putting my hands that close! I took some of the other toggle clamps and made their bases have slotted holes so can put them in more positions. This was just a few hours and some scraps but it makes the sled that much more useful. I have the stops made in both 1/2" and 3/4" thick varieties depending on my needs. I'll make some more stops and hold downs for the sled. Last time I was at the home store I grabbed a bunch more button head bolts in varying sizes so I have plenty around to hold things on. Good to keep a bunch of these and washers on hand to make the attachments needed! I also started working on a new project, but this on is writing about the process of woodworking. I'm going to love doing this, I have quite enjoyed keeping the blog up lately and also writing my Creative Thinking Blog. I won't release too many details yet, but there may be some bits and hints over the next few weeks about what I'm doing. The week had very little major project work, but some good time spent building and maintaining jigs. That's time that can really pay off in the future. I can totally recommend putting time into jig making, it will always help you. Where oh where has the week gone? I could swear it was just Monday. This happens far too often when you're an independent woodworker with a day job and a variety of other personal duties. We try our best and we find times to still make a bit of dust. And I managed to get some quality time in the shop regardless. I have two of the new cipher wheels with the constellations on them oiled and drying. The main work here was to carve the second one, get it painted and then cleaned up. Then came time to make the dials that let you turn the inner disc. These are just two discs made from 5/8" walnut. I went simple and these and just drew them with a compass, cut them on a jig saw and sanded to my lines. Where I added some challenge was to make a hole in the center to hold a threaded insert. I wanted a flat bottomed hole down to 1/8" from the bottom. Regular brad point drill bits would have their points go through that last 1/8". So, I mounted them in the CNC and made a quick program to cut them. I had to put in a v-bit so I could align it's point with the center of the disc (from the compass), clamp it down then switch to a 1/8" spiral and make the cut. Sure, it was probably overkill, but it worked great. I installed the threaded inserts back at the drill press. It's helpful to have another set of hands or clamps here (I had a wife!). I cut the head off a 1/4 20 bolt so I could put it in the drill chuck them put the insert on it with a few nuts to hold it in place. From here, lower the quill and turn the chuck by hand. I repeat, turn this by hand! Pressure on the quill while turning sets the inserts totally straight. It's a great way to get the job done. Last was a bit of sanding, glue on the dials and then put a few coats of danish oil on all the parts. Wipe them dry a bit later and now I'll let them cure a few days before top coating with some wipe on poly. They oughta look great then as I get them posted to Etsy. Oh yeah, after doing some photography. Making some new videos would be cool too. I'm also looking for other alternatives for laser work to finish off the engagement box commission. The shop I wanted to use is closed while they move and it appears they are taking longer than expected. Made some calls and have a new person to see this week. We'll see. I had hoped to use the Fab Lab maker space so I got the experience of using the laser. That about did it for the week. Not a lot happening, but really good to see some projects move along. Progress is progress, always good to look at it that way. Each day brings new challenges, new failures but new successes as well. It's the successes we have to keep our eyes on. Failures are just there as guides on what not to do. This week was mostly about drawing, but fortunately drawing for use in woodworking. I recently purchased as Wacom Intuos drawing pad because I had wanted to get better at drawing and found I can use it for woodworking drawings too. I have wanted to make new symbols for use on the cipher wheels and after a bit of looking and searching I decided to make a set of constellations. These are similar to what you'd see watching the old Stargate show (love that show, hope it comes back sometime!). Using the pad and another tool, Autodesk Sketchbook (currently free for hobby/student use) to draw all the constellation symbols. I used some pictures found around the web as a guide. The trickiest part is getting the thickness of the lines right as these will turn into v-carve paths for the CNC. Sketchbook has tools for drawing straight lines or circles plus all the freehand methods. It was a combination of both, some guided drawing then a bit of free hand to fine tune. Once I had them drawn, I could save this as a .TIFF file and moved over to V-Carve (I use desktop 8.5, I should upgrade at some point). Here I can import the tiff file and then trace it. Since I drew the constellations as solid black shapes they traced well and I didn't need any editing. All that was left was to group the right lines to make the full constellation and then arrange them around the ring, create the toolpath, export and carve away. I used the Oramask again and got some very nice cutting. I found if I slowed down the CNC a bit I had less of a chance of lifting the mask. It does add some time, but I'd rather wait a few more minutes than fix issues. All the usual followed - paint, wait, peel off all mask and marvel at the new piece. It came out looking great! Painting did take a while, lots of little bits to fill in. I tried a sample with spray paint but that has a tendency to bleed (maybe due to the alcohols in it). Maybe I can get around that by first sealing with some spray shellac first. I also carved a second center but didn't have time to paint it. I had a few chip out spots I'll need to fix first (cut and stick little pieces of the stencil mask) before painting anyway. I did mill up some new edging and wrapped the cipher wheel body. Soon I'll have two new cipher wheels with the constellations as one of the cipher languages! The other shop work was a bit of maintenance - coating the cast iron surfaces with some Boshield T9. I've used that for several years now with pretty good success. Spray on, wipe off and then I find after I wait a few hours I have to buff it down as it dries a tad sticky. After a light buffing it gets nice and slick again. Bit light this week, I know. I'm hoping the Fab Lab is open again so I can get there and do the laser work for the engagement box and wrap that project up. Well, I wish I could say this work was more devoted to woodworking than it was, but too many other facets of work and life intruded. I was out several nights this week and then Saturday was taken up doing work around the property. Sunday opened up a bit, so I took advantage of what time I had. The CNC club met Thursday night. So, while I wasn't working myself I was watching and talking about woodworking. A demo was done of 2 sided cutting with V-Carve then run on the Axiom. (kinda wish I had this one! I don't work here, just who I know sells them.) I liked the technique and have to try it out. Plus, i would love to have a water cooled spindle - they are so quiet it's eerie. With one of those and the Festool CT26 I wouldn't need hearing protection CNC'ing. 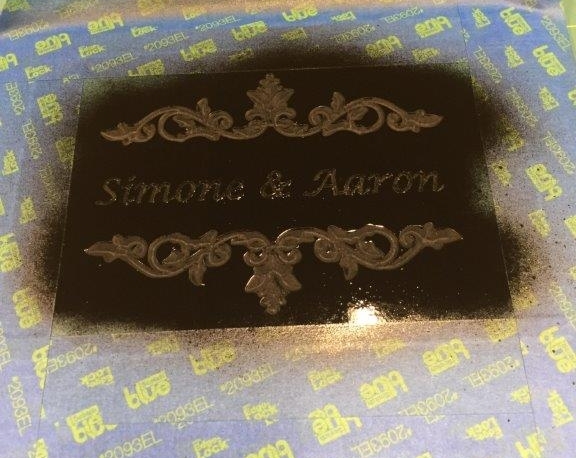 Plus we got to see some cool engravings on acrylic with a diamond bit and then lit with LEDs that looked awesome. Sunday I was in the shop and decided that the test of cutting a cipher wheel with the Oramask went so well I should just finish it. So I wrapped it with walnut moulding. I do this with a 22 1/2 degree cutting jig attached to my table saw sled. I cut all the pieces to rough size, then I cut one side of each edge piece to the angle, then I can set it in place and mark where to cut the other side. I use the next piece as a test to see if I was cut exactly - you'll feel a little ridge if it's too long. Plus, you can look at the inside edge and see if there is any shadow meaning it's a bit long. The jig lets me shave off really small amounts if needed. Too short, well, then your stuck, no fixing that except with a new piece so be careful. Some glue and some blue tape, wait a few hours and they look great. Now I have to decide what new symbols I want to put on the inner ring. I'd like to do hieroglyphs or constellations. 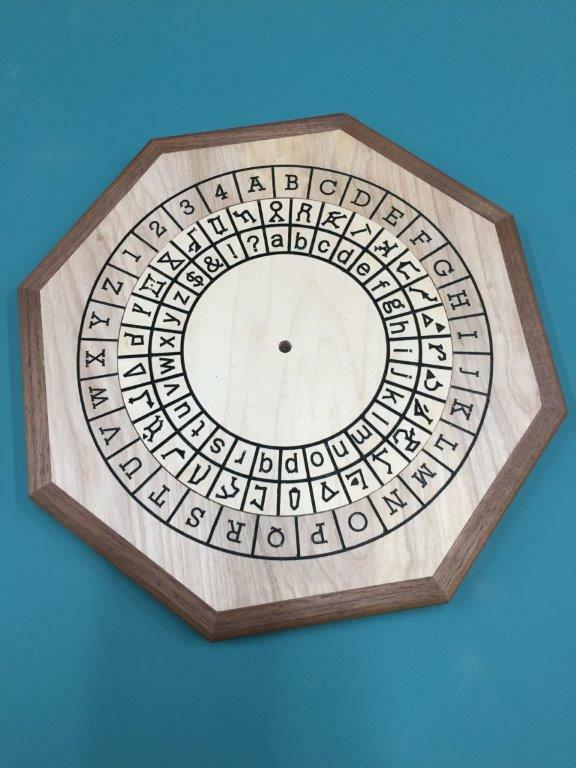 I worked on the design of the main cipher wheel and discovered I can make the outer ring letters a bit bigger. I did this in V-Carve, created a new .tap file for cutting and then made another. It looks good. I did all the cutting and just have to do the paint filling. One bit of the logo on the back had the Oramask come free but I think I can fix that by cutting a small piece, sticking it on and knifing it to the exact size. I had the spare blank so I figured why not have another. I swapped out the 27mm hose on the CT26 and instead used the 2 1/4" hose from the old shop vac. I get much better pickup this way. Still running it through the Dust Deputy. On the CNC there was only the dust that was left right in the cut, most of the rest was captured. 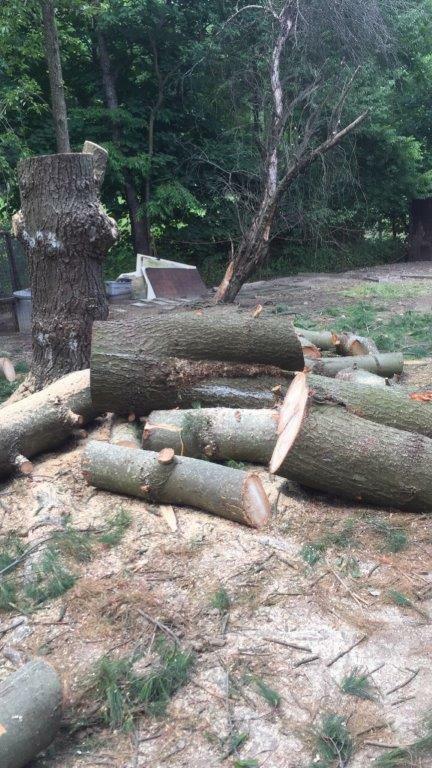 Cut down an old apple tree, so that sort of woodworking. Needed to swap out the chain and the big saw and then it went through like butter. Well, until I popped the chain off in a cut and might have bent it as I couldn't put the chain back on. This is my life, just when I'm getting somewhere something dumb happens to derail it all. I'll have to check the sharpener to see if this is fixable of the chain is trash. That's the week. Kind of light, but that's how they go sometimes. This was a vacation week for me. The day job was on holiday all week (it was an extended 4th which is normally just 2 days). I had planned to do some traveling and some hiking, but the Northeast here was in a heat wave most of the week and hiking wasn't much fun. So we stuck around home and took it easy. This might mean I should have done lots of shop work, but the point of vacation is to take a break and that's what I tried to do. It wasn't all non-woodworking though! Throughout the week I taught myself a bit of photo editing. Why, you ask? Well, for the engagement box commission I need to do a laser engrave of a picture. The one he liked had some extra people and things in the background. After an hour or two with GIMP and a few YouTube tutorials I had deleted those other people from existence and completely filled in the background. Now it's on to the laser! A new friend arrived in the shop. I now have a Festool CT26E for dust collection, to replace my old Rigid shop vac. One benefit of a day job is some occasional bonuses that for me came in Amazon form. I wouldn't have bought one of these but the bonus really offset the cost. This little fella is really quiet. Like, amazingly quiet. Strong, too. It's different from a shop vac as it really is best when hooked to a tool. Suction drops quickly about an inch from the nozzle. But when connected, it's great. I still run mine through an Oneida Dust Deputy to preserve the filter bag in the CT26. I have it hooked up to the CNC. It seems to leave more dust on the surface (the dust shoe on this isn't that great) but that's quickly vacuumed up after and nothing is blowing around. I may see if it has a larger hose, though, it's a fairly narrow one. I love the quiet, though. it's just amazing. When hooked to my sander I can work without ear protection as both tools are really quiet. I got a roll of the Oracal Oramask 813 and gave it a try cutting a cipher wheel. It worked very well. I took off the backing, set it down and rolled it with a j-roller. I had a bit of an "M" lift slightly but I was able to set the mask back down. I filled the letters with acrylic paint and then peeled it off when dry. it stuck well, and lifted a bit of grain, but came off easily enough. It was tedious as I needed to go around with a knife to get the pieces up. The letters were super crisp. I love the look. it takes more time but the result is quite good. Lastly I tried a carving for the lid of the engagement box. I wanted to put a fleur pattern on with the names as well. The fleur is rather large and even with a 90 deg V-Bit it had to carve pretty deep. But, I put on the Oramask, carved the decoration and the names (names were with a 30 deg pencil bit) I decided this time to tape off the top and try spray painting the letters. It's drying as I write this, so I'll see what it looks like tomorrow. It was an experiment, so who knows, maybe it'll look great. That was my work. Until next week, stay dusty! You know how last week I said I was getting more shop time I was looking forward to continuing that. Yeah, well, it's good to want things. The week just kinda went away on me. I don't know where it went, but I certainly wasn't with it. I even tried calling but apparently it's phone was off. I was left with more to do for the day job (that data won't analyze itself, well, yet but I'm working on that too) and some weeknight activities that didn't involve sawdust. Fortunately the weekend opened up slightly. I started out doing a quick job to make my life easier. Any time I have a chance to make a jig I think is time well spent. It's pretty rare I only do something once. If I have the jig, repeats are a snap. This time I made some simple additions to my puzzle makers sled to cut some common angles. These are for 45 and 22.5 deg cuts. These can bolt down onto my sled and different distances but the common is just against the fence. I made them out of 3/4" MDF and that lets me stand shorter stock on edge or flat to cut the miters. I can also put stops on the sled for easy repeats. A few labels keep me from wondering what is what. I spent the rest of my time on the lid of the engagement box. I pulled out my setup pieces and taped them back up so I could set the lid in place and layout the positions of the lock cut outs so I could test everything. I'll be cutting pockets into the box so I want to make sure this all works before doing it on the real one. It's a small pocket, so after laying it out I just chiseled them in. Even assembled I have room to do this. The locks did need a slight bit of adjustment to make sure the moved and didn't stick at all. I'm thinking of having the top of the lid screwed on so that repairs are still possible later. Turning both keys retracts the locks and you can lift the lid using the keys. You have to turn both keys to retract the locks when closing. I may try to taper those little lock pieces that stick out so they can lock themselves when the lid is closed. This setup box is great looking, isn't it? I've used it fora bunch of things, it's all cut up now. I hinged the lid on pins that come in from each side. You can see the bit of metal rod I'm using to set things up. I cut a few pieces long so they are easy to take out. This is a nice way to make a lid that won't have a normal hinge. The main thing you have to do is miter or round off the bottom back edge of the lid so it has clearance to pivot. I'll probably end up gluing the pin into the side of the box after assembly so it can't work it's way out. Just don't glue it into both the side and lid or it'll never open! The final will use some brass to look nice. I started working on something I could attach to the back that would hold the lid open at a nice angle. it will have a laser engraved picture inside and I think displaying that would be great. I didn't come up with anything yet though. There went my weekend. Well, I also had to help deliver some sheep, write an article for my Critical Thinking Blog, play some of the new God of War (such a good game), watch a movie, eat some pizza. Yeah, I try to relax a bit on a weekend too since work is right around the corner on Monday. I'm happy to have the engagement box nearing completion and looking forward to sending it on a journey around the world. Then, onto other projects. Hey! I managed to get some shop time this week. It felt sort of novel, actually. Weather was fairly nice which made working in the evenings nicer too. Looks like the nice weather is about over as summer closes in though. I didn't do a ton of work, but I felt good about getting some small but necessary things designed and done. I am liking this weekly update format - it keeps me thinking about what I've done and hopefully I can give some ideas or a bit of entertainment to other woodworkers or creators. The time this week was spent on work for the engagement box as I close in on completing it. I mainly spent the time working on the lid locking assembly. On the sample lid, I made several incarnations of the lock and key assembly and found the one that worked. This is a fairly typical lock and key that uses a wood spring and a wedge on a pivot to move the locking bar back when the key is turned. I had a few tries to get the wood spring right. It is made from ash and is 1/16" thick. I epoxied the spring into the lock body. I need to adjust (or make a new) piece on the left one here as it's a little short and doesn't extend the spring quite as far. I think it's easiest to make the rotating piece a tad big and then sand it to final size. After the main lock was in place, then I could mark out the hole location for the bars that will actually lock the lid. I just drilled that out near size then completed it with jigsaw and chisel. I want to put a piece across the top of both bars so that it can't ever move in any other direction. The CNC came in handy for making sure the holes for the pivot pins aligned perfectly with the cutouts in the top for the keys. Next up was something fun. I tried cutting acrylic plexiglass on the CNC for the first time. I must say, I expected some type of catastrophic failure, but the result totally surprised me. I had wanted to try cutting an iris mechanism out of acrylic and after getting some advice at my last CNC club meeting, I decided to give it a try. While at the meeting, I picked up and 1/8" upcut spiral - you really want to get the chips away or the plastic will weld itself back. I ran the router as slow as I could, about 8000 RPM and kept a slightly slower feed rate. I also had the dust boot off and was following the bit with the vac. It is very messy, throwing plastic around. I kept a respirator on as this process can release some nasty fumes. My only real problem is that while I had the sheet held down well, since it was thin the middle pieces tried to lift. I should have also stuck it down with some double sided tape. I broke one leaf that I needed to re-cut. I cut the pieces free, assembled them and it worked. It worked fine. I was frankly very surprised. I could do this again. While at the CNC club meeting I also got a tip on a product called Oramask 813. It is a stencil film that supposedly can take being on a CNC and stay down on even very small parts. It's pretty cheap too, from just $5-15 per roll. I hope with this I can lay down the film, cut the letters and symbols on cipher wheels, paint them then pull off the stencil. I could try different colors on the wheels, all kinds of stuff. I'll post more once I've had a chance to try it out. Not a bad week as things go. Hopefully I can keep this momentum into next week. Even bad days in the shop are still pretty good. And the only thing worse than a bad day in the shop is no day in the shop. I got some small awards from the day job that I think are going towards something new for the shop too. Stay tuned. Till next week, stay dusty. Guess how this week started out? Yep, too much time spent with the day job. But at least it's starting to slack off a bit and give me some openings again. I hope work continues to lighten up, so, you know, I can get to work. I am a bit worried about the iris drawer binding up in humid conditions, so one night I CNC'd out another set of parts. That wasn't too long and while they are cleaned up they need a bit of sanding and fitting, maybe just another hour or so. I figure this way I haven't a second set ready if needed. My goal, if I need to, is to make a drawer that someone could open to repair if there are ever problems. I wanted to do that initially, but thought I should lean towards just finishing instead of making it a little more perfect. It's a real balance. I might still want to make one out of acrylic but some research told me I need a new bit, probably single flute upcut. Plus, using home store plexiglass isn't good as that is extruded, but there are other versions to buy that respond better to CNC'ing. The engagement box lid got some nice work down over the weekend. I made the two heart keys. Doing these meant figuring out how to make some tricky cuts. First was cutting the flat on the edge of a dowel. 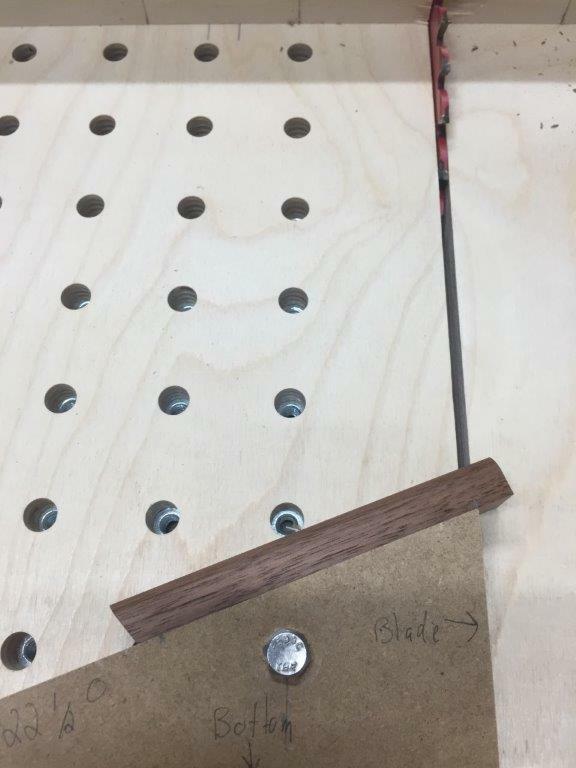 I made a fairly simple jig that holds the dowel in a v-groove with a toggle clamp and then I can slide the whole jig along the fence to cut away a flat section (using a flat top bit). Then, I needed to cut a notch in one end to hold a little heart section (just jigsawed out). I tried several clamping scenarios that were all dicey garbage and then finally, I just drilled a 1/2" hole in a bit of MDF to hold the dowel vertical then aligned it on the saw to cut a 1/4" groove through the middle (using my box joint blades). With the keys wrapped up I started in on the locks. I'm using a design from Tim Detweiler's book Making Working Wooden Locks . I had to some drawing so I got to have fun with graph paper and ruler and a compass. I'm planning on using a fairly standard wood spring. I finished the drawing, cut out the two lock bodies and then realized I made a teeny mistake. I made the slot to hold the spring 1/8" when I wanted it 1/16". I figure I can either fill that extra at glue up time, or just re-cut them as they are pretty simple to make. I need to make the wood springs and I know I have some nice flexible ash around. These will sit inside the lid and I'd like to make sure the mechanisms are accessible. Lastly, I have to say again, I love setup blocks. I am reaching for these more and more often for all my setups. I think the main reason is that as I get older, well, I don't see so well and it's easy to miss a line on a ruler. But stacking a few setup blocks together is almost foolproof - I just need to get the right blocks. And it's so simple to those between the blade and the stop. I really need to get a larger set and maybe a few more 1-2-3 blocks. Combine these with digital calipers and everything is readable and easy to use. It was nice to get some real time back in the shop. You know, like a few hours in a row. I look forward to finishing up these lid locks.